Samsung’s smartphones sport some of the best cameras in the industry, and the Galaxy S7 and S7 Edge take incredible photos - even in auto mode. However, for shutterbugs, the Pro mode is a must-have. It takes an already excellent camera and pushes it further, bringing DSLR-style manual controls to your smartphone. The Galaxy S7 and S7 Edge sport a wider f/1.7 aperture in the lens, larger micron pixels in the image sensor, fast focusing Dual Pixel technology, and optical image stabilization (OIS). As such, you can do even more with the Pro mode on the S7 and S7 Edge than ever before. Although it may take some getting used to, using the Pro mode is well worth it. Here are some cool ways you can stir your creative juices and shoot some great images when going manual with either phone. An interface with a lot of options may seem overwhelming, and Samsung peppered Pro with a myriad of settings that could understandably cause some confusion. The main controls within the interface are along the right-hand side. From top to bottom, you have settings for filters, focusing, white balance, ISO, shutter speed, and exposure control. Selecting any one of these options shows another vertical slider to adjust each setting on the fly. The adjustments you make appear on screen in real time, so you have an idea of what the effect looks like. The filters are pretty self-explanatory. Focusing takes greater control over zeroing in a subject, which may be more useful when shooting macro close-ups. White balance adjusts color to look more natural, and a handful of different presets along the vertical line help guide you. ISO dictates the level of sensitivity to available light. Shutter speed determines how fast or how long the sensor takes in light. Exposure adjusts the brightness and contrast. To the left, the interface offers other controls that are more basic in principle. Again, from top to bottom, you have automatic focus, focus metering, timer, flash, photo quality, and settings. Most of these are pretty academic, but the top two offer adjustments in how the focusing bracket works, be it a tighter focus or a wider one, similar to how metering works on a DSLR. You can tinker with this if you want to be a little more artistic, but if not, stick to the default settings. While Auto mode on both phones is very good, sometimes it’s worth getting a firmer grasp with Pro mode to improve composition, because Auto won’t always get the color and contrast right. For example, shooting a sunset in Auto tends to raise the shutter speed, lower the ISO, and adjust the white balance to avoid washing out the whole image. It’s not a bad result, but the software is also being cautious by not going far enough. If you’re facing a situation where there’s a lack of depth or detail, try tinkering with the shutter speed, ISO, and white balance — in that order. Adjusting the shutter might be enough on its own, but having the other two as fallbacks should help you come out with a better shot. The wider aperture on both phones is fixed, so even in instances like a sunset, the amount of light coming in is going to be fairly high, regardless. That can mess with colors and make what should be a dynamic scene look pedestrian. With better color and contrast, photos will look more artistic and interesting. The Pro mode’s manual settings make it easy to get there. The results here are some of the best you will attain on any smartphone to date, especially in Pro mode. The wide aperture and larger micron pixels are a huge benefit, while the quick focusing and manual controls help to capture some amazing images with less noise and blur. Night and low-light shooting has always been difficult on smartphones, and while the Galaxy S6, S6 Edge and S6 Edge Plus (including the Galaxy Note 5) took a leap forward, performance, and output is even better on the S7 lineup. 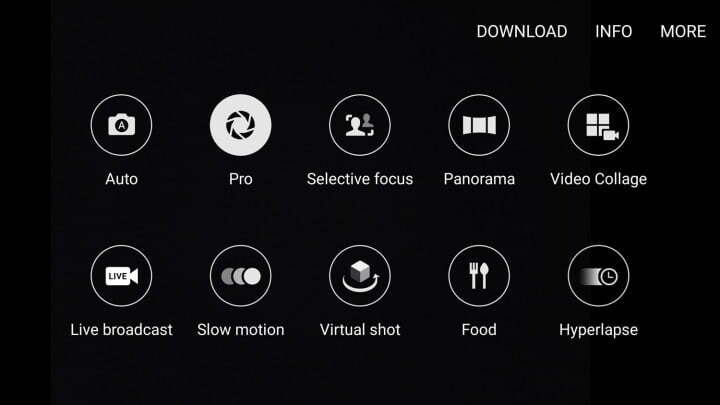 Of course, there is no “night” or “low-light” mode in Pro, as you would generally see in scene modes under Auto, so you have full control over each photo. The advantages of shooting in RAW over JPEG are numerous, but the gist is that you get far more control over editing and processing afterward. Since a RAW file retains about 10x the data a JPEG has, the level of detail in the image is uncompromised, because no processing has actually taken place. It’s a great way to tinker with more intricate tools using photo-editing software on a computer, or a capable app, like Adobe Lightroom. The Galaxy S7 and S7 Edge can shoot in both RAW and JPEG, but there is no RAW capture by default. To turn that on, go to the settings icon at the bottom left in Pro mode and choose “Save as RAW file.